Synopsis: Rayna De, stuck in a dead end job with a boss from hell, zero love life and the big 3-O looming large on the immediate horizon, has started to panic a lot. Enter new object of lust in the office, Deven Ahuja, and Rayna is overpowered by inappropriate visions of Cupid aiming his arrows straight into her heart, with tutrle doves doing their billing and cooing act in the backdrop. Alas, Deven is completely out of her league despie the contradictory messages he seems to be sending out, and is, as decreed by page three supplements of the city newspapers, the man in the life of the gorgeous, light eyed model-turned-actress Sharbari Raina. As Rayna battles with her crush, shaky employment status and dithers about signing up for domesticity with the approved-by-her-parents Sid Bose, she discovers that life has its own plans. 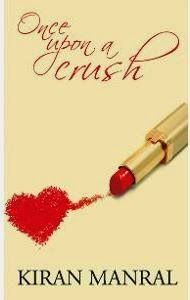 Review: Once Upon A Crush is a story of Rayna De, born and brought up in the picturesque city of Kolkata, now poisted in Mumbai, fears she will permanently die single with no boyfriends around, forget a husband. Gosh! I managed writing such a long sentence! Yes, this will happen when you complete reading this fresh, witty and long sentence induced, a little sparkle of a story by Kiran Manral. After having read many books, it is for the first time I felt that, yes, long sentences works wonders if used correctly without changing the desired meaning, on the contrary to ‘Keep your sentences short’ idiom that many preach. The story is set in today’s time where one is not shy to check the chemistry first and then commit on a relationship leading to the couple getting eventually hitched. And Rayna De is one such powerful character in the book who will make you remember things which you have done while in office or when the object of lust is around you. Like mentally aiming poison tipped darts at the retreating back of the boss or the heart suddenly doing things like popping out and dancing. Each and every character in the story is well laid out with some unique properties that stands out like that of the greasy oiled Mathur, apart from the central characters, Rayna De, Deven Ahuja and Sid Bose. The plot is tightly weaved and revolves around Rayna’s life which includes her office, her limited friends, and Deven Ahuja which quintessentially keeps the readers involved. The writing is exceptional and brilliant with the author possessing a strong command over the language which is quite evident by the choice of words used throughout the story along with some funny lines. The editing is up to the mark as I didn’t find any proof reading and grammatical errors. Overall: You must grab this book for the author’s command over story telling which will practically leave you turning pages till the last word and also to feel or to live once again those days of crushes and believe in love. A must read! Please note: This is a PR requested review, given for a review copy. This is not a paid review. All the opinions expressed in the review remain my own and remain unbiased and uninfluenced. Have a copy, will read soon.